You don’t travel through 10 countries in six months without learning a thing or two about traveling smart with a credit card. In fact, here are 100 tips to make the most of your rewards miles and have a safe, smart trip. We’ve even broken it down into phases to help you step-by-step! 1. Review your dream destinations. If you’re in the market for a new travel credit card, look for the best rewards value for the parts of the world you most want to visit. 2. Factor the annual fee into the overall value of a card. Depending on your spending habits, you may be better off applying for a card with no annual fee, even if it means earning fewer points. 3. After reviewing your finances and credit, consider having your spouse or partner apply for the same card. You may be able to double your points by taking advantage of promotional offers twice over. 4. Add each other as authorized users. Many cards offer a one-time bonus for new cardholders who add an authorized user during a certain introductory time frame. 5. Ask about a “refer a friend” promotion. If the card issuer awards bonus miles for referrals, this can be an excellent way to rack up rewards. 6. Apply at the right time. Keep an eye out for limited-time promotional offers that could get you more points. 7. Know when points expire. If your next big trip is 7 years away, a card with points that expire after 60 months might not be the best fit for you. 9. Or a favorite hotel. You can earn free stays and special perks by showing your loyalty (and using your card responsibly, of course!). 10. Take advantage of any introductory bonus offers you can. Many introductory offers require you to charge a certain amount in purchases within a set timeframe after you open the card. As long as the required spending fits with your finances, these promotions can be one of the best ways to get tons of points in a short period. 11. Some airline credit cards offer extra miles if you sign up with a partnering TV or energy service. Compare with other offers in your area to make sure you’re not overpaying for the service. 12. Save for retirement. Several airline cards also offer bonus miles for opening an account with Fidelity. 13. If you don’t mind sharing your spending habits, filling out surveys can be a source of extra miles. This is most common with airline travel credit cards. 14. Combine miles on your card with frequent flier programs when possible and when you can get the most redemption value for doing so. Some points are more valuable outside frequent flier programs. 15. Opt in to any rotating categories a card offers. Cards that offer higher rewards on rotating featured categories often require you to register for each one. 17. Investigate a dining rewards program for extra miles. United Airlines recently ran a targeted promotion allowing some new members to earn 5 miles per dollar at participating restaurants, as well as thousands of bonus points for meeting spending thresholds. 19. Let rewards points inspire your gift-giving. Flower sellers often offer impressive mile-per-dollar-spent ratios. If family and friends would love a bouquet, it’s a win-win. 20. Give to charity. Your donation to organizations like Susan G. Komen could earn you miles, points or cash back per dollar donated. 21. Sign up for the airline or hotel’s newsletter, if they have one, to hear about mile-earning deals. Promotions can be easy to miss, so why not have them delivered to your inbox? 22. Set up online account access. Make sure you can keep tabs on your account no matter where you go. 23. Set up automatic payments, payment reminders on your calendar or a bill pay app. Don’t miss a payment, even when vacation days start to blur together. 24. Notify your issuer about travel plans. Skipping this step, even if you’re only traveling a few states away, is just asking to have a hold put on your card at the most inconvenient moment. 25. Ask about different helplines for domestic or foreign travel. Don’t assume the 1-800 number works if you’re calling from overseas. 26. Add helplines to your phone address book. True, you can look up numbers online if you lose your card, but it’s faster to have them ready in your phone. 27. Ask about daily spending limits. Good to know if you want to charge a hotel reservation, shop, and splurge on expensive show tickets all at once. 28. Ask whether using the same card too many times in one day will raise flags. A high number of transactions in a short time may be suspicious to a card issuer, especially if they occur far from your home address. 29. Ask if you’re eligible for an increased credit limit. Your utilization ratio can impact your credit score, so having more credit to work with can help keep the percentage you use lower. 30. Ask a travel agent or friend which cards are commonly accepted at your destination. Not all cards are accepted everywhere. 31. Pay the bill before you leave for cards you’re not taking with you. The whole point is to be able to take your mind off of things at home, right? 32. Make sure no card is due to expire during your trip. Counting on a card you suddenly can’t use anymore is no way to enjoy a vacation. 33. Synchronize credit card due dates. If you contact your card issuers, you may be able to customize the day of the month your bill is due. 34. If syncing due dates up isn’t possible, pick a day before the earliest due date to pay all of your card statements. 35. Ask about travel insurance. Don’t fork out for travel insurance if your card’s got you covered. 36. Ask about roadside assistance. If you blow a tire on a road trip, your credit card issuer may be able to help. 37. Pack multiple cards. You’ll want a few credit and debit options so that you always have a card that works. 38. Don’t bring every card you own. Three credit cards from different issuers and two debit options is plenty for most trips. 39. Lower your daily cash withdrawal limit. If your card gets stolen, this minimizes the damage. 40. Have a chip and PIN option. It’s standard for many merchants outside the US, and it can be difficult to navigate around this requirement, even with proper ID (especially at unmanned kiosks or gas stations). 41. Make sure PIN is 4-digit, not 6. Your card may not work abroad otherwise. 42. Use your miles! It seems obvious, but some cardholders just don’t get around to redeeming rewards. Don’t freeze over actually using the stash of points you’ve been saving. You can keep tabs on all of your rewards with an app like AwardWallet or Tripit Pro. 43. At the same time, crunch the numbers before you book. Don’t “overspend” on a flight just because you’re using miles instead of dollars. If you find an amazing deal, use your hard-earned miles toward another part of your trip. 44. Hunt for bargain destination offers from the card issuer. A credit card company may slash thousands of miles off the cost of a featured destination. 45. Look at multiple hotel locations. Booking close to the airport often costs far more points. 46. Compare round-trip versus mix-and-match one-way tickets. You might even decide to fly into one country and out of another. 47. Get a deal by combining flight and hotel or rental car. Compare costs for separate and combined bookings to get the best value. 48. Concentrate points on one travel expense. If a country’s cheap to travel in but expensive to fly to (or vice versa), use miles only for the expensive part and save extras toward your next trip. 49. Look for rewards points deals before setting sail. Many cards will let you redeem miles for cruises as well as flights. 50. Check with the card issuer to see if booking through their portal or a particular airline gets you bonus miles. 51. Check whether off-peak timing for a flight can save you miles. Destinations have high seasons and low seasons for tourism, so you may stand to save by not following the crowd. 52. Browse offers to redeem miles for activities. You might find itinerary inspiration or have a chance to skip the line on a popular attraction. 53. Set a trip budget. It’s a no-brainer, but without a budget it’s way too easy to be tempted to splurge. 54. If you’re buying gear ahead of time (for a camping adventure, for example), use price protection to match the difference if you spot a better deal. You’ll have to submit a form and possibly your receipt, but it’s worth a few minutes of your time to guarantee the lowest possible price. 55. Include incidental fees on trip budget. You’ll be charged when you convert currency and possibly when you use a foreign ATM. If your card has a foreign transaction fee, that adds a few percentage points to every purchase. 56. Download a currency conversion app to keep you on track. Would you know how much 1,000 Indian rupees is worth without checking? 57. Check the U.S. Department of State’s website for travel alerts about fraudulent behavior or common scams in various destinations. 58. Check for airport perks. Early boarding, VIP lounge access, or reduced in-flight snacks can make a long flight easier. 59. Pack light, and use a card that lets you check a bag for free. Tip: If you can fit all your necessities in a carry-on, bringing an empty suitcase lets you stock up on souvenirs. 60. Learn about global concierge services. Your card issuer may be able to help book alternate routes or accommodations if your plans suddenly change. 61. If your budget allows, get room service or hotel upgrades. Your hotel credit card can lead to a swankier stay. 62. Ask about a merchant hold before swiping at a hotel. Some hotels temporarily hold a few extra days’ worth of credit, which can max out your credit limit. 63. Pick a primary card to stay on-budget. Having most expenses in one account gives you the best at-a-glance review. 64. Opt for credit as your primary. Generally, credit cards are more secure than debit cards. 65. Bring a debit card that has no ATM fees where you’re traveling. A $5 ATM charge here and there adds up quickly. 66. Keep your spending in check and be vigilant of your credit utilization (how much credit you’re using, compared to the overall credit you have). 67. Group cards by perk. Know at a glance which cards are best for hotels or have no foreign transaction fee. 68. Wear your card close to your heart. A pouch under your shirt is safer than your pocket. 69. Invest in a waterproof pouch or belt if you’re going on an adventure trip. Take money and cards white-water rafting! 70. Don’t take all cards with you when you go out. Keep one or two cards separate, just in case. 71. Store cards you’re not carrying should go in the hotel safe. 72. Buy a travel safe if you’re staying in hostels, or at least a sturdy padlock. There may be a locker you can use, but you’ll need to provide your own lock. 73. Read online security reviews for the area. Complaints about theft at a hostel or muggings nearby should raise red flags. 74. 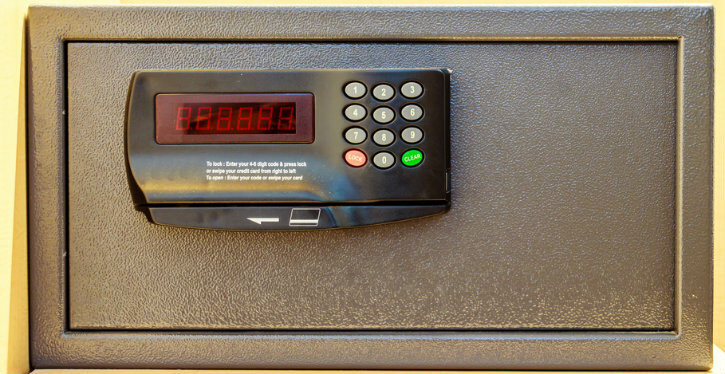 Make photocopies of your cards, capturing the issuer and the phone number. 75. Block out the card numbers. If you need to report your card stolen, the issuer can find the account number. If left on the copies, anyone who comes across it can use the card to make phone or online purchases. 76. Store the photocopies in a password-protected cloud-based document safe. 77. Look for an ATM at the airport when you land. If you’re country-hopping, it may not be possible to get local currency beforehand. If you need cash right away, opt for an ATM over a currency exchange for better rates. 78. Use Google Maps to find an ATM near your hotel. If you don’t need cash before check-in, this can be a better bet than the airport. 79. Use a primary card with no foreign transaction fees. 80. Know what the foreign transaction fees are on other cards in case you have to use one. 81. Visit ATMs that are well lit and visible. 82. Set a curfew for yourself on how late you can make a withdrawal. It helps avoid both late-night theft and impulse withdrawals after partying. 83. Check each ATM for a skimmer or other suspicious device before inserting your card. 84. Don’t withdraw a lot of cash. It’s safer to carry small amounts, and credit cards are widely accepted in most parts of the world. Even if it seems like a better “deal” to pay an ATM fee on a larger withdrawal, you’ll end up paying extra if you need to convert funds back into U.S. dollars. 85. Don’t take a cash advance on your credit card except in a true emergency. Interest rates are too high to make the quick cash worth it. 86. Beware electronic pickpocketing via RFID. You can buy protector cases for your cards for a few dollars through sites like Amazon. 87. Sleep on your valuables on overnight buses or at an airport. Use your backpack as a pillow instead of stashing it in an overhead compartment if you’re napping. 88. Keep cards in view at all times. There have been reports of restaurant staff copying credit card information for fraudulent purposes. 89. Don’t leave tip field blank. Write “cash on table” so a dishonest employee can’t write a tip into the field later. 90. Get the bill in local currency. Having a bill converted to dollars seems like a handy way to track expenses, but some businesses convert at an unfavorable rate for you, meaning you end up paying more. 91. Keep an eye out for surcharges for using a credit card vs. cash. This doesn’t happen often, but it’s annoying if you encounter it too late. 92. Check your account more often. You want to catch any misuse of your card as quickly as possible. 93. Log in on your phone, not at a computer cafe. Even if the network’s secure, it’s easy for someone to peek over your shoulder. 94. Sign out instead of letting the session expire. If someone snatches your phone at the wrong moment, they won’t have your account at their fingertips. 95. Avoid using a credit card at a train station platform or other super-crowded place. You’re showing everyone where you keep valuables. 96. Don’t walk through an open market with your card in your hand. It’s tempting to have your card ready in your hand as you browse. Put it away, or use cash. 97. Use purchase assurance for broken souvenirs. A lesser-known credit card benefit is that many companies will reimburse you for items that are stolen or accidentally damaged within a certain time frame. 98. Use your activity record to budget your next getaway. Looking at how you actually spent on a trip can help you put together a realistic budget. 99. Keep receipts. You’ll need them to use purchase protection or dispute a charge. They’re also a handy budgeting aid. 100. Check for double billing. Dispute an error promptly, and it should be relatively easy to resolve. Got any favorite tips to add? Tweet us @CreditSesame. Thanksnfor the good tips! Some of these are really useful and hadn't crossed my mind.